What’s more special than making memories with the ones you love? ❤ Whether you’re celebrating with family, friends, or a special someone, here are three ways you can tap into your creative side this Valentines Day! Going to see a show is a cultural experience that, for just a few hours, transports you to another time and place and can leave you feeling enriched long after the curtain closes. There’s something special about sharing that experience with those you love and the discussions it can spark over after-show drinks or ice cream. Set in 1860’s Bangkok, this Tony Award-winning musical tells the story of the unconventional and tempestuous relationship that develops between the King of Siam and Anna Leonowens, a British schoolteacher whom the modernist King, in an imperialistic world, brings to Siam to teach his many wives and children. 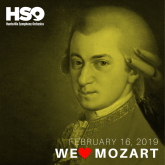 It’s all about Amadeus this February evening, as HSO and the Huntsville Community Chorus present two of Mozart’s most breathtaking masterworks. A church service in Salzburg saw the premiere of the C Minor Mass through which the young maestro introduced his wife Constanze, a fine soprano, to the hometown crowd. A perfect soundtrack to a romantic evening out on the town. An inspiring and educational show for families. Eleven year-old Akeelah spells words because her daddy taught her to. After she wins her school’s bee, she buckles down and studies hard for Nationals against all kinds of odds: bullying friends, gun violence outside her window, and the ongoing mourning for her father. Audience members will cheer Akeelah’s triumphant journey about the transformative (t-r-a-n-s-f-o-r-m-a-t-i-v-e) power of education, adult mentors, and friendship. Recommended for ages 9 and up. Nothing builds relationships better than trying something new together. 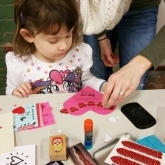 These classes, workshops, and events allow you to get hands-on creating and making art all your own – or to gift! Print a set of Valentine cards on Green Pea Press’ 105-year-old letterpress! The press will be set up with vintage metal type and illustrations to create 5 designs. They’ll help you place the cards and spin the flywheel to print a full set of your own. Stay to embellish to your heart’s content with paper, scissors, glue, stamps and more. This is a drop-in workshop for all ages. Get to know Huntsville’s maker community while you learn how to use a plotter cutter and heat press to make a custom t-shirt at this Monthly Makers event! If you aren’t a STEAMworks member, it’s just $20 to participate. Vinyl, tools, and instruction will be provided along with a limited selection of t-shirts. To customize the project to your liking, they recommend bringing your own t-shirt or other items to print on! Remember that iconic scene from Ghost? It’s just like that, but you’re the star at Designbyhart Pottery’s date night wheel-throwing class! Couples will share a wheel and work together to create a piece of pottery. Designbyhart will supply everything you need – the flowers, chocolates, instruction and more! Just come for the fun and new experience. This is a BYOB event, so 21+ only. $75 per couple. Space is limited so reserve your spot now! It’s the hottest Valentine’s ticket in town – literally! 🔥 The 5th annual “Pour Your Haert Out” celebration welcomes back Sloss Furnace to help guests create hand-crafted hearts, poured with molten scrap iron. Get your tickets now for this awesome hands-on Valentine’s celebration featuring food, drink, and live music at the Davidson Center for Space Exploration! These guided painting classes offer a laid-back atmosphere to unleash your inner artist! Spirited Art has a calendar packed with adorable date night painting classes for friends, couples, and families. 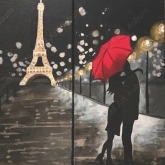 Scheduled paintings include moody wine bottles, a romantic Paris date night scene, hot lips, flowers, and a glass painting + axe throwing date night class! Not sure what you want to do, but you’ll know it when you see it? Explore Lowe Mill’s calendar for classes on everything from the Basics of Watercolor with Huntsville Art League to Comic Art Class at Superpowered Studios to Thursday Night Swing Dancing! There’s no shortage of new, exciting, and creative experiences to be had at Lowe Mill! The way to the heart is through the stomach, right? Say ‘I love you’ to your tastebuds at these delicious events! Love is in the air at this Valentines-themed breakfast for the entire family! On the menu: Cupid’s french toast, sausage, fresh fruit, and a hot chocolate station to start the day off on a happy note. After breakfast, kids can get creative making Valentine’s crafts, have their face painted, and visit Queen Bee for a “Bee Mine” photo shoot! 🐝 Adults $12, Kids 3+ $10, $50 family pack. Stroll the galleries with your Valentine or Galentines at Huntsville Museum of Art for just $5 after 5pm on Thursdays! The museum also offers $5 glasses of wine while you tour the collections and features live music on the 3rd Thursday of the month. 🍷 Currently on display: Our Shared Heritage: Alabama Artists from the Collection; Encounters – Jared Small: Southern Moments in Time; Looking at the Collection: People | Places | Things (an interactive exhibit!) Afterwards, pop down to Pane E Vino for pasta, pizza, and…more wine, of course!